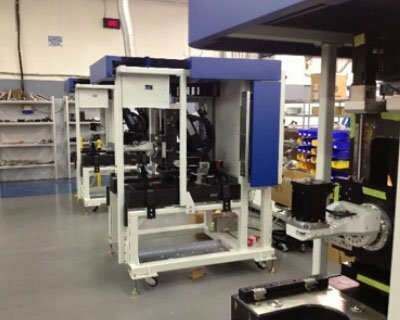 An Elite100 Optics Polishing company utilized PEKO’s Product Development Engineering capabilities to develop a ground breaking next generation Optics Polishing System (Development Case Study). Once PEKO solved the challenge of designing a working product, the customer needed pilot and production units, and fast. The customer’s main technology is in their consumable polish, and this process equipment is a paramount to selling the consumable. This meant finding a high-end Contract Manufacturer capable of large scale and repeatable manufacturing of complex equipment and machinery. An instrument of this caliber the utmost care to ensure perfect performance. Primed and ready, PEKO’s Contract Manufacturing division beat out the competition to take on the task. PEKO assigned a Program Manager with electrical engineering expertise to lead the way. His team included Manufacturing Engineers, Production Planners, Assembly Supervisor, Quality Personnel and Purchasing. This team ensured all necessary steps were taken to ensure success on such a complex build of low to mid volumes. Bill of Materials was reviewed and finalized, component parts released to in-house manufacturing, off-the-shelf items procured, Quality documentation created and more. This type of complex machinery required PEKO to create hundreds of detailed work instructions and train the assembly technicians to execute. Dealing with the pneumatics, hydraulics, servo and other motion controls requires great thought and foresight to manufacture correctly. A 7,000 Square foot area was dedicated to the assembly cells for these machines, and in-house testing is done at the end of each build to ensure the product leaves PEKO with perfect performance and minimal debug. Specialized crating is used, and product is shipped directly to the end user. By choosing a contract manufacturer with PEKO’s expertise, the customer delivers a high-end, reliable product that delights the customer. The success of this product has driven both increase in equipment Sales, but also increased Sales of the (profitable) consumable polish. Their reputation as a top performer in their industry is bolstered by not only providing the latest technology, but also a product that lives up to the name. The customer is delivering excellent product, and Sales keep increasing. By providing such a tremendous solution, the customer is leveraging the same success into different size models to capture even more market.